I love me some free-form, thoughtful, intersectional feminist poetry, so I'm thrilled that I was able to pick up peluda by Melissa Lozada-Oliva. 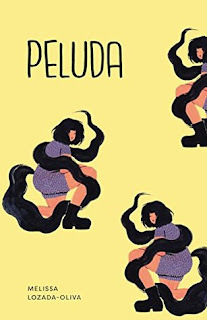 Filled with biting, vibrant poetry, peluda is a close examination of girlhood, cultural identity, Latina identity, immigration, and body hair. This series of poems tackles heady and deeply personal subject matter with wit, grace, anger and humour, organically illustrating the complexity of gender in both public and private space. These intersections of identity are chronicled through each poem, giving a confessional tone throughout the text. Occasionally experimental in form, the poems of peluda are also filled with complex language and metaphors, code-switching between English and Spanish, enhancing the conversational and confessional tone. Melissa Lozada-Oliva balances these multitudinous ideas and themes in a way that never feels overwhelming, confidently allowing the reader to consider the many things being said. To that end, peluda isn't afraid to ask what hair does and means, what our bodies do and mean, and how they are compromised, protected, and negotiated by external - and often oppressive - systems. It's a bold and thoughtful account of femininity, the body, and the ways in which those concepts and realities are expressed.